A new Instagram account has been launched calling out famous pastors for their taste in expensive shoes, some of which cost approximately $4,000 per pair. The Instagram account @preachersnsneakers started recently and currently has 31 posts. In less than three weeks it gained over 8,000 followers, a Thursday article in Fashionista explained. It now has 68,300 followers. 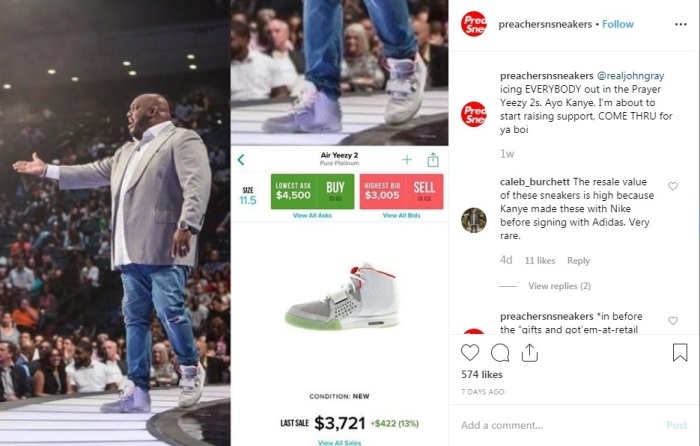 The account’s founder, Tyler Jones, a pseudonym, explained it began as a joke but noted that the juxtaposition of pictures of pastors sporting pricey, trendy sneakers alongside the prices of those things has resonated with an audience. The photos raise questions about how the money donated to these pastors’ church is being used. The account has even caused pastor Chad Veach of Zoe Church in Los Angeles to change his Instagram handle after a preachersnsneakers post showed him with a backpack from Gucci that goes for $1,980 and Rhude trackpants that cost $794, Fashionista reported. Before he changed his handle Veach commented that he did not pay for a single thing he was wearing in that post. He subsequently deleted the comment. “That’s when I was like oh, this just got way more real than I ever intended,” said Jones, whom Fashionista interviewed on condition of anonymity.